We gave the girls a choice of free rolling/drilling time or techniques. A majority opted for technique. The request was for triangle techniques, so Kat Gibson (RGA) and myself went over some basics of the triangle and and a variety of setups. We then moved on to timed sparring rounds for a good hour, before winding down with some free-rolling time, to give the girls time to discuss techniques and spar a little more. 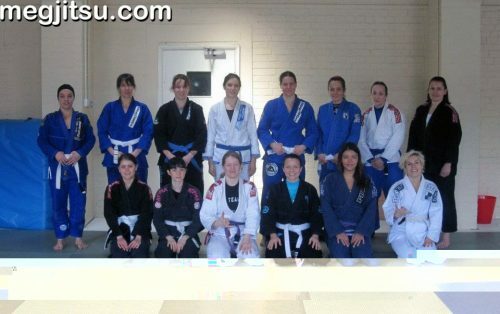 Honourable mention has to go out to Susan Mansfield who won her division in Saturday’s women-only BJJ competition and to Zsuzsi Carneiro de Moura who, totally new to BJJ, came along to the open mat, ‘borrowed a gi and got stuck straight in to techniques and sparring’. That’s what it’s all about! Stay tuned for details of our Q3 Open Mat which will be announced shortly. Meg, I love hearing about these successful women’s open mats. I am jealous, though, because I wish I could come!! 🙂 Glad it went well! I understand a good time was had by all and great to see so many new faces! felt that way when I went to Abu Dhabi for the World pros. Holy crap never seen that many girls in one mat before in my life! Got to roll with purples, browns and blacks! Prior to this I’ve only ever rolled with a Blue. What an amazing experience.